Our ancient sages, spiritual thinkers and philosophers of Vedic Hinduism have contemplated upon the inevitable end of life – death. Perceptions regarding death have evolved from their contemplations as well as from the numerous ancient scriptures. In this philosophy, death is seen not as an end to all but a pivotal step towards the eternal existence of the human soul, or, in other words, a temporary cessation of physical activity. When talking about the vision of death and dying, on one hand, we are reminded of the quintessence of Sankara’s philosophy, who had preached: “Brahma Satyam Jagan Mithya Jivo Brahmaiva Na Aparah”, which can be translated as: “Brahman (the Absolute) is alone real; this world is unreal; and the Jiva or the individual soul is another form of the Brahman.” On the other hand, several other spiritual thinkers have lucidly articulated a different set of religious beliefs in the Atman and the Brahman. They have emphasized on the intensification and expansion of the religious and moral connotations of life, death, and human action; in other words, on Dharma, Moksha, and rebirth. Years later, the intense spiritual thinker Rabindranath Tagore, who was himself a Brahma by descent, had remarked that death is not an extinguishing of the light. It is, rather, an act of putting out the lamp to welcome a new dawn. This perception of Tagore, which embodies the quintessential celebration of life through the vision of death, has yet again been visualized through the lens of another great thinker and filmmaker, Satyajit Ray. While discussing the concept of death and how it celebrates the force of life, the Apu trilogy – comprising Pather Panchali (Song of the little Road, 1955), Aparajita (The Unvanquished, 1957), Apur Sansar (The World of Apu, 1959) – comes to mind. Exuding a raw energy and supreme power of art, the entire trilogy, on the surface level, traces the epic journey of the protagonist, Apu, from his impoverished rural boyhood to his years in Baranas and Calcutta and, finally, to his marriage and fatherhood. On a more metaphysical plane, the three films depict the unique life of the protagonist in various stages, repeatedly facing deep spiritual questions centered round the vision of death. In the first film of the trilogy, Pather Panchali, which was shot entirely in rural West Bengal, India, Ray’s camera explores universal themes of life, uniquely focalized through the protagonist Apu’s idyllic childhood with his sister Durga and their old aunt, Indir Thakrun. Critics have remarked that Ray’s most truthful, unobtrusive, and modern photographic style in all the three films of the Trilogy was inspired by the Italian neo-classical cinema he was so much in love with. The three films encompass the physical and spiritual journey of the protagonist Apu, as he moves in his life through traumatic incidents, loss of loved ones, departures, and failures, to the ultimate attainment of independence and maturity. Apu, through this journey, becomes the quintessential warrior, the existential protagonist whose vision of life is shaped by the natural wonders of the earth in his childhood, by emotional challenges and family tragedies in his adolescence, and by separation, solitude and self-discovery in his youth. The theme music of Pather Panchali, played on a bamboo flute and taken from a song which the old woman Indira Thakrun sings to herself in her long and persistent wait for death, tugs at the heartstrings with a searing, penetrating lyricism, quite unmatched in the history of cinema. The song, “hari din to gelo shondhya holo/paar koro amare,” refers to the crossing of the river at the end of the day by a helpless voyager of death, metaphorically evoking the crossing over from life to death. The little unforgettable images of idyllic childhood- Apu, Durga, and the ducks in the village parading after the local candy-man in a Felliniesque fashion; Durga giving her old, frail aunt guavas stolen from the neighbor’s orchard that inspire Indira Thakrun’s huge toothless grin; the excitement and pristine pleasure of the siblings induced with the sight of a running train piercing the rural landscape – lend a humane quality to the film. On the other hand, there is a subtle but clear juxtaposition of birth and death, affection and anguish, pettiness of everyday life and the joys of the everyday that leave indelible images on the mind. The juxtaposition of life and death, or the journey of life and its end is depicted in the film with intrinsically woven sequences. Durga and Apu’s frantic search for the train in the vast, open field strewn with white Kash flowers is one of the most lyrical, evocative scenes in the film, symbolizing the children’s quest for the world beyond their reach. The onset of monsoon brings hope, joy, and new life. Ray’s lenses follow the first rain drops of the season, falling on the bald pate of an angler, on the water hyacinths in the pond, and over the trees in the field. The momentum slowly builds, drawing Durga to her dance in the rain (one beautiful, evocative work of cinematography). Gradually, the storm rises in ferocity, threatening the foundations of their dilapidated house and, ultimately, claims Durga’s life. On the other hand, Apu’s aunt, Indir Thakrun’s death scene contains a vital emotional and visual sweep of the film, as the scene shows the child Apu’s first tryst with the concept of death. At the end of the film, when Durga dies, Apu is seen performing his daily mundane tasks of combing his hair and brushing his teeth. Here, Ray’s lenses seem to suggest that he will now be destined to travel his own path alone. In the following film, Aparajito (The Unvanquished), the ten-year old Apu is shown coping with his father’s sickness and his mother’s over-protectiveness in Benaras. 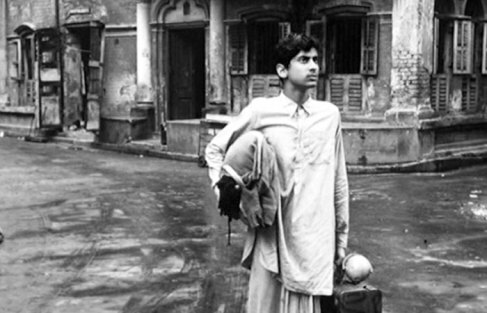 The boy struggles to achieve independence, demonstrates his academic gift, and, ultimately, journeys to a decent university life in Calcutta. The most evocative death sequence comes at the moment of Apu’s father Harihar’s death, where Ray films with precision the glimpse in Harihar’s eyes as he swallows his last drops of holy water from the Ganges. The pigeons on the roof of the building flap skyward noisily. As a seventeen-year old, Apu is seen to lead a new life with each death in his family. The mother dies in a sequence that begins with visuals of her son’s sun-dial. The scene continues through the fireflies of the evening and ends in Apu’s encounter with the empty house in the village. The sequence suggests that the boy will undertake a new journey in life again. In the last film of the Trilogy, Apur Sansar (The World of Apu), Apu earns a living by tutoring, spends most of his time vaguely fantasizing about his future, plays the flute, writes his novel, and quite accidentally starts his family life by marrying Aparna. Apu’s detachment from nature in his adulthood starts with the first reel of the film, which records his dingy one-room house near the train lines, the same train, which once denoted the outside world for the child, Apu. On the surface level, this detachment shows Apu as a recluse. On the metaphysical level, it suggests the onset of a new phase of his life, which teaches him to find happiness in his family life. Apu’s relationship with his wife, which begins with trepidation and poverty, gradually matures into an enduring and adorable one. However, in a twist of fate, the young bride leaves to be with her family for childbirth and never returns. At the thematic level, her death in childbirth proves to be the final blow to Apu. He buries all his dreams and discontinues his unfinished novel to seek “peace” through mundane work in a remote mine. However, at a symbolic level, the recurrence of death reiterates the overall theme of the trilogy, that death and birth must make their mark in human life. This trope of birth and death recurs throughout Apu’s life, and culminates when, years later, the father Apu reunites with his five-year old son, Kajol. The last scene of Apur Sansar, which shows Apu carrying Kajol on his shoulder, very evocatively depicts Apu’s final salvation after traversing a long and weary road. This salvation is the very essence of the concept of “moksha”, which forms the nucleus of the philosophical teachings of “Vedanta” and “Vedanga”. The co-existence of life and death, as the obvious counterpart of life, is the nucleus of the Apu trilogy. Ray’s cinematography is instrumental in depicting this co-existence after the style of neo-realistic cinema. This is true in the case of Pather Panchali, where the child, Apu, living on the edge of poverty with his sister and his family, struggles to understand the greater truths of life – the nature of man and his ability to face the future – through two deaths in the family. In Aparajito, the poignant lyrical quality of life is interspersed with death, depicted in some scenes with the adolescent, Apu, and his surroundings. The ghats (shores) of Benaras and the village of Mansapota, where he moves with his mother after his father’s death, embody a sublime, deeply affecting struggle between death, life, and the personal experiences in Apu’s mind. The celebration of life through the mystic vision of death continues till the culmination of Apu’s journey in Apur Sansar, where Apu’s tragic world is represented with subtle symbolism. The death sequences in the three films of the trilogy are marked with brilliant innovation, calculated to give them a new intensity of a personal experience in Apu’s mind. Ray’s lens follows child Apu’s mental world, who gains maturity and salvation at the end of the trilogy, after a weary journey full of vulnerability, despondency, pessimism, escapism, and hardheartedness, the cumulative result of the deaths and personal losses he encounters. The choice of the riverside as the location for the final scene of Apur Sansar, where Apu carries his son Kajal on his shoulders, is charged philosophically, conveying the endless ebb and flow of life, which must go on, despite obstacles. In the realm of our philosophy, where both birth and death are perceived as two distinct illusory stages of human journey in the world, the self-realization of the human mind, regarding the birthless and deathless “Atman,” the Infinite, is emphasized as the freedom from birth and death. 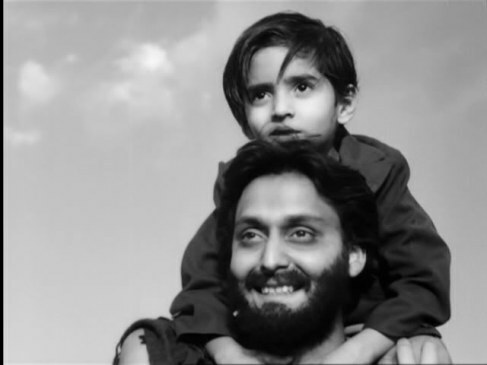 Likewise, in the Apu Trilogy, Ray has explored the elemental beauty and the ultimate reality of human life that underlies the death sequences, the scenes of disconsolate grief, and excruciating struggles in Apu’s mental world. Thus, through Apu’s poignant journey, Ray accomplishes the metaphysical task of depicting life as a cycle of creation, preservation, and destruction, which lies at the heart of the six Vedangas and the six systems of Hindu philosophy. Lopa Banerjee is a freelance writer, poet, and mother of two beautiful girls. She is also in her final year of studying creative nonfiction writing at the University of Nebraska, Omaha. She has just completed her memoir, a book-length collection of personal essays and stories on her childhood and her internal journey titled, Thwarted Escape: A Journey of Migrant Trails and Returns. Her poetry, essays, articles, and book reviews have appeared and are forthcoming at Prairie Fire, 13th Floor Magazine, Fine Lines, Yahoo Voices, The Mind Creative, Incredible Women of India, and Ampersand Review. Read the latest issue of Cafe Dissensus Magazine, “Here and There: The Diaspora Universe”. Edited by Bhaswati Ghosh, author & translator, Canada. Read and discover a group of extremely talented writers sharing their experiences of living in-between multiple worlds. I am so fortunate to have watched all three films and your immersive writing further brought out the myriad spiritual, transcendental way in which Ray’s trilogy has depicted life as it is: in the constant hum and humdrum of existence.